Libby's Little Addiction: December My Monthly Hero - Release + Giveaway! December My Monthly Hero - Release + Giveaway! Hello and welcome! It's the first Monday of the month so you know why I'm making an appearance here on my blog - it's time for the December My Monthly Hero release from Hero Arts! This month the kit will take you on a magic carpet ride. Not gonna lie, I was singing "A Whole New World..." the entire time I was creating with this month's kit! There's so many awesome things going on with this card! 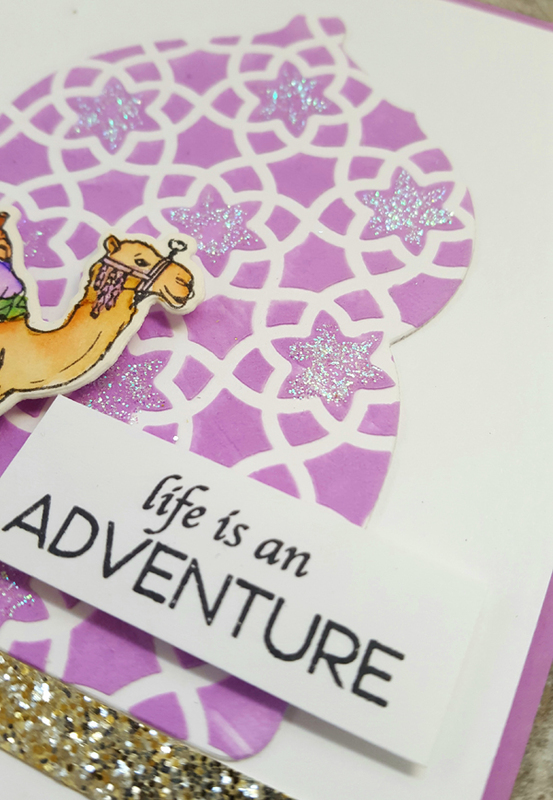 First, I colored the camel with my Zig Clean Color markers, and die cut him with the matching Frame Cut. For the background, I used the stencil that's included in the kit (isn't it gorgeous??) with some embossing paste. Hero Arts included TCW's modeling paste as an optional add-on this month. This stuff is super fun - I recommend you give it a try if you've never used it. I put a little pile of it on my craft mat, and tinted it with an Orchid re-inker. It also works to tint it with your ink pad. I'll be sharing an Instagram story about how to do this today - be sure to check it out if you're interested, I'm stampinlibby on IG. After the embossing paste was completely dry, I used the frame portion of the window die cut included in the kit to cut out the shape. A bit of Stickles on top added a little shimmer, and I finished the card with a message from the kit and some gold glitter cardstock from my stash. Here's a look at this month's awesome kit. It comes with FIVE exclusive inks - very nice! Now it's time to hop! Be sure to visit all of these blogs and leave comments - Hero Arts will be giving away one kit to a lucky commenter, selected from the comments left across all of the blogs in the hop. You have until Sunday, December 10th to get those comments in, and the winner will be announced at a later date on the Hero Arts blog. Be sure to get your kit asap - once they're gone, that's it! The other items in the release will be re-stocked, but not the main December kit. Kits begin shipping on Friday, December 7. I'll be back this week with more examples from this month's awesome release! Affiliate links are used on this blog, at no extra cost to you. Thank you for supporting me, and clicking on my links to shop! your card is awesome - love the shimmers! Auwe...So Cute and Adorable Camel who is right on Life IS An Adeventure! Beautiful CAS Creative Work of Art. Well Done. Great work! Love to see the embossing paste in action! 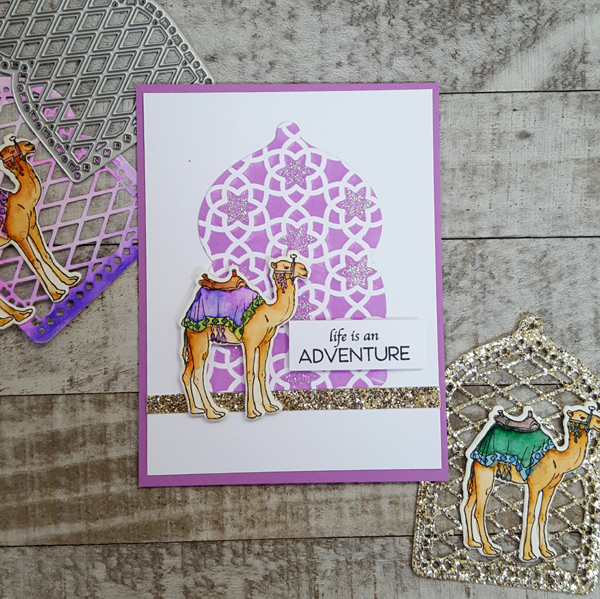 Love your camel card and I've enjoyed seeing what everyone has created using the kit and add-ons! Thanks for sharing!! wait for mine to arrive. Beautiful card, Libby. That camel is adorable. Gotta love the camel and the way you used the negative of the frame die. Lovely card, this new kit is amazing! Just stunning! I Love your colors, patterns, design, and that camel...Love...and an amazing kit. Love it! So pretty! Love your color combinations. Love your design of your card. Thanks for sharing and have a wonderful week! I love how you used the stencil and die. Pretty choice of colors. Love the colors and that bit of sparkle. Perfect.. Love it. What an amazing card and kit! This is so beautiful, thanks. Love the card and all the sparkle. Libby, I love your card. The colors and coloring is beautiful. Thank you for sharing. What a brilliant post with fabulous design. Loving this kit, so many ideas throughout the hop. Great job! So pretty, and I love all the sparkle! 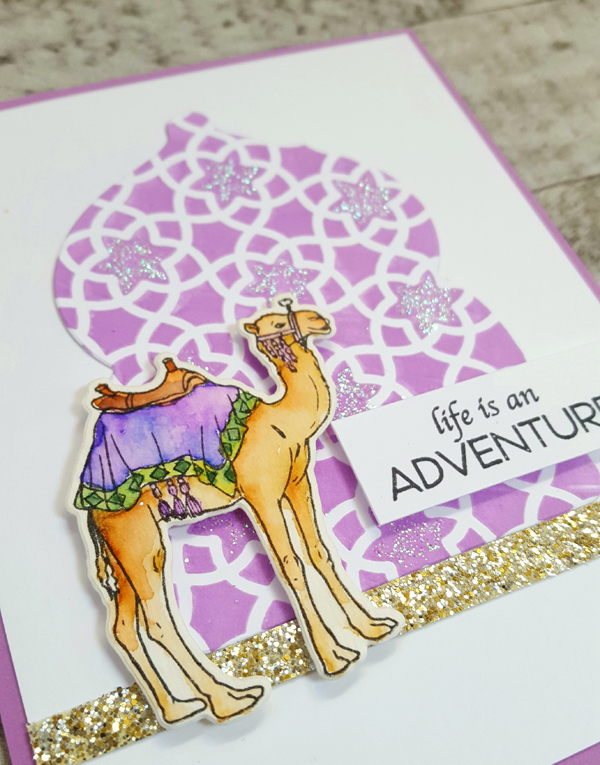 Love that colored stencil background and the super cute camel, thanks for sharing. ~Gin K.~ those tags look great also. Beautiful cards! I love the colors and the gold strip of sparkling sand is perfect! Yay! I love the colors you used and I didn't know the door / window die is 2 different dies? I love this card! thank you! I love your card... the way you embellished the window is awesome... looks like jewels. Great card. Cutest camel ever! This is a great card, love the shimmer! I'm totally in love with the stencil pattern, so I think that was a great idea to use it to fill in the door/window cutout with a different pattern. So smart! Thanks for sharing a lovely idea. Great card, love the texture & sparkle. I'm so excited about this kit. Wow! I’m totally in love for your awesome card!!! Colors are amazing!!! Love how you used the kit! Very prettY! I really need to get some TCW White Modeling paste. What a great card. All the bits of glitter just add to the enchantment of this fantastical card! Really enjoyed the effect of the background die on this card... very striking! I just love the camel! And the colors are fabulous. Well done! Awesome card! Love the colors and details! So pretty with the sparkle. Cute card. Thanks for sharing! Gorgeous colourful card! I love the touch of glitter! Beautiful card. This is such a fun kit with so many great images. Love the use of the orchid color. I wouldn't have thought of it but it works here. Will go to the Hero Arts page and IG to see the other examples and the inking video.